Adler Yacht appointed Mr. Philipp Pototschnik as new chief executive officer, effective immediately. The new CEO’s key task is to lead the Swiss company’s further development and promote expansion on various regional markets. Philipp Pototschnik takes the helm from Alessandro Barizzi. Philipp Pototschnik has been hired as sales and marketing manager for Adler Yacht in March 2017 and, thanks to his effective performance during last months, he was promoted to the leading role with the company. Raised in Austria and Italy, Philipp is polyglot with proficiency in six languages, including German, Italian, English, Spanish, French and Russian. He graduated from the Business University of Vienna and undertook studies at Clark University in Warsaw and Lodz in Poland, as well as the London School of Economics in the UK. He has previously worked in the web marketing and development, renewable energy, health and luxury sectors. “It is my great honor and pleasure to have Philipp Pototschnik as the new CEO of Adler Yacht. Philipp has shown in the past months great enthusiasm and efforts in getting the best for the company, and moving this forward”, said founder of Adler Yacht Alexander Vagacs. Adler Yacht also continues to gather a strong team of experienced sales and marketing experts. The new manager to join the company is Esmeralda Fernandes De Sá, a highly experienced professional in sales of aircraft and a well-known expert in the luxury market and aviation. Named Adler’s new International Sales and Marketing Director, Mrs. Fernandes De Sá was born in Vienna, Austria. Fluent in several languages, including Portuguese, German, Serbian, Croatian, French, Spanish, she has been working in the aviation industry in Austria since 1989, most recently at Cessna Citation and Embraer. Last weekend, the Azimut Summer Wave arrived in Palma di Maiorca, in the Balearic Islands, for a new event in La Dolce Vita 3.0, the programme of glamorous initiatives organised in the Mediterranean’s most beautiful tourist marinas to celebrate the luxury, style and joie de vivre of the Azimut Yachts brand. This “wave” of glamour was set in motion by Azimut Yachts onJuly 7 at the enchanting Porto Venere marina, before calling at Bodrum in Turkey and then mingling with the crystal clear waters of Greece on its way to Mykonos. On Saturday August 5, it was the turn of Palma di Maiorca, where a fleet of Azimut yachts, including the 77S, the 55S and the brand new Azimut S7, was moored in the beautiful Puerto Portals marina for guests to visit and take on sea trials. At sunset, owners had the opportunity to experience all the glamour of Azimut Yachts, accompanied by music, champagne and a spectacular display of acrobatic stunts by athlete Lindsay McQueen. Then, on Sunday August 6, all eyes were on the brand new Azimut S7, the yacht with sporty lines and an edgy style presented in a world preview exclusively for owners attending the event. The Azimut S7 toured the most beautiful bays on the island, calling at Illeta, Playa Oratorio and Portals Vells. During the day of sea trials, customers had the privilege of going on board the new jewel before its official presentation at the upcoming Cannes Boat Show and were pampered with exclusive concierge services that reflect the brand’s lifestyle. The Azimut Summer Wave’s parties and parade of yachts has toured the Mediterranean, bringing with it the brand’s Made in Italy lifestyle built on luxury, style and innovation: La Dolce Vita 3.0. Team Gryphon kicked off the South Carolina Governors Cup by winning first Place in the Bohicket Marina Invitational Tournament on John’s Island, S.C., held May 10-13, 2017. The anglers released three blue marlin for a total of 1,800 points. The tournament series also included the Georgetown Blue Marlin Tournament, May 24-17; Carolina Billfish Classic in Mt. Pleasant, June 21-24; Megadock Billfishing Tournment in Charleston, July 5-8, and Edisto Invitational Billfishing Tournament in Edisto Beach, July 19-22. After Gryphon scored second Place in the Megadock tournament, the overall outcome of the series was all but a forgone conclusion. Team Gryphon’s total score of 7,475 points for the tournament series smashed the previous SCGC record of 6,075 points. While Gryphon’s Captain Chucky Moore, Colby and the rest of the team all contributed to the outcome, the star of the SCGC indisputably was Colby’s son, 15-year-old Chandler Griffin. Chandler, who was the SCGC series’ 2nd Place Outstanding Youth Angler in 2016, outdid himself this year by catching 5 of Team Gryphon’s blue marlin and 12 of the sailfish. He personally accumulated 5,400 points, shattering last’ year’s Outstanding Youth Angler’s score of 1,400 points. Oceans Apart from the Rest. It’s been Nordhavn’s slogan for nearly 30 years, and time after time, its been proven just how literal the company takes to that statement. While others claim to be the best at producing seaworthy, long-range cruising yachts, Nordhavn actually does it. Through its engineering practices, design philosophies, no-shortcuts mentality, experienced team, same-ownership group, and adventurous owners who have taken their boats to the actual ends of the earth, Nordhavn has proven year in and year out, that they are the undisputed leader in ocean-going passage-making yachts. As the old saying goes, if you’re gonna talk the talk, you better walk the walk. Consequently, beginning with the September issues of various boating magazines, Nordhavn will be launching an advertising campaign that very descriptively points out the criteria that makes this so. It starts with a list of cruising achievements made by different Nordhavn owners. Other brands boast about a single yacht making it around Cape Horn or having crossed an ocean. But Nordhavn’s track record of hundreds of ocean crossings, multiple roundings of Cape Horn, and record-setting expeditions is beyond compare. To emphasize this, it will be introducing the “Oceans Apart from the Rest” Ad Campaign Web Complement, where details and facts will back up the statements. Nordhavn will launch the new online feature with a very extensive list of Nordhavn Cruising Accomplishments that supports its September ad. Then, with each new ad we roll out, supplemental testimony - specific to that ad - will be presented on the Ad Campaign Web Complement. The Web Complement feature will go live in late August. Look for the "Oceans Apart from the Rest" logo on our the Nordhavn website to find details. Moonen has opened a new corporate office in Florida as part of a strategy to take top-quality motoryachts to the Americas. “The new office is designed to supplement our already excellent relations with brokers in the United States, Explains Moonen MD Emile Bilterijst. “It will enhance our ability to offer a first-class service to Moonen owners, Moonen captains and all those with a heart for our unique brand in this part of the world.” The new Moonen representative office is found at Dutch Masters, situated on 17th Street in Ft Lauderdale next to Port Everglades. It is easy to reach from Ft Lauderdale and Miami airports and has port access for yachts at the front door. Ray Groot, the director of Dutchmasters, will serve as a first contact point for potential clients, passing on sales enquiries to our dedicated sales team in the Netherlands. The yard sales team will also be available in Ft Lauderdale once a month to address any specific wishes people may have. “The US market is more open than ever to the high-end Dutch quality that Moonen represents,” says Ray. “There is a clear shift away from GRP to well-built steel and aluminium motoryachts. As megayacht owners become more individualistic they’re embracing the kind of far-reaching customization which Moonen offers. The desire to be able to say ‘I created a motoryacht to my own wishes and specs’ is much stronger and people know that Holland is the place to have their dream realised. The time for Moonen to really breakthrough in the US and South America has now arrived – and this new partnership with Dutch Masters will help make that happen.” Known as the Yachting Capital of the World, Fort Lauderdale hosts the biggest boat show in the world, attracting over 105,000 visitors from around the world, with two other major shows close by in Miami and Palm Beach. Moonen had a successful time at the most recent show in Palm Beach, where a number of people asked us to showcase Dutch quality yacht building to the region with a more permanent presence. The new office is the first step in an exciting new journey! At this years Cannes Yachting Festival, Princess Yachts and Bentley Motors reveal the limited edition Continental GT Convertible Galene Edition designed by Mulliner and inspired by Princess Yachts. The new car is the latest collaboration for the two iconic British brands who share a philosophy that blends luxury and performance. Bentley's bespoke commissioning division, Mulliner worked closely on the new GT model with the Princess Design Studio, and together created the ultimate edition of the world-class convertible, inspired by the design and craft of Princess' award winning super yachts. The Galene named after the Greek Goddess of calm seas  features a Glacier White exterior with a flash of Sequin Blue on the lower bright ware, emulating the styling lines of a contemporary Princess super yacht hull and the glistening reflected water line. Darkened front and rear lamps take inspiration from the tinted windows on Princess vessels, while a dark blue hood completes the distinctive look. Nautical design continues to the inside of the GT Convertible, taking cues from the unique and uncompromising interiors found in every Princess yacht. An entirely new marerial finish was crafted by Mulliner for the central console - a unique pinstriped walnut veneer that echoes the teak decking on a Princess yacht. For ultimate customization  something both Princess and Bentley pride themselves on offering their customers a bespoke illustration from world-renowned artist Jaume Vilardell that features a Princess and the co-ordinates of the brand's Plymouth shipyard, can be included on the interior fascia panels. Quality hand-stitched seats and door panels accentuate the console and create a space full of light and luxury. The design collaboration for the Continental GT Convertible comes after Princess and Bentley Motorsport announced a three-year sponsorship deal earlier in the year. It will see Princess branding on the livery of the 2017 Continental GT3 as it participates in races around the globe, as well as ongoing joint activities to bring the worlds of luxury yachts and motor racing together in exceptional experiences for Princess and Bentley customers across the world. From favourite boat of directors and actors in several successful films to courtesy boat for the most famous and glamorous film festival: it was only natural that Riva would arrive in the Lido playing a leading role on the international jet-setting scene. The world’s most famous shipyard will be present at the 74th Venice International Film Festival, scheduled to run from today, 30th August to 9th September, as a partner of Fondazione Ente dello Spettacolo (FEdS), the Italian National Foundation for the Performing Arts. A Riva Lounge, inspired by the unique style of these legendary yachts, symbols of the “Dolce Vita” and of elegant living, will be open for the entire duration of the Festival in Sala Tropicana 1 of the Hotel Excelsior, the Lido’s famous meeting place and point of reference, which will host a full calendar of events organized by FEdS. VIPs, guests, directors and actors whose films are being shown at the Festival will be able to relax, pass the time and give interviews in this exceptional location, a part of which will be furnished entirely with exclusive décor from the Riva Brand Experience. The design of the chairs and tables, the materials used and every small detail demonstrate the artisan quality that is a hallmark of the Riva brand, evident in every historic hull crafted from mahogany, as well as in the masterpieces manufactured in the shipyard nowadays. The refined line of accessories from the Riva Boutique collection (available at www.rivaboutique.it) will also be on display in the Lounge, providing the final touches to its decoration. A selection of these unique and one-of-a-kind items will be provided as an exclusive gift to Riva Lounge guests, who will be able to take home a piece of the excellence that comes out of a shipyard that is emblematic of “Made in Italy” quality. Furthermore, for the entire duration of the Festival, customers, actors and artists will be able to come aboard and experience sailing on a magnificent Aquariva, an iconic model and heir of the historic speedboats of the past, made available as a courtesy boat. This is Riva’s second Lounge in Venice. Indeed, ever since 2015, the historic Gritti Palace has already been hosting this unique space on the terrace of the Bar Longhi, overlooking the Grand Canal. The Lounge, an ideal open-air extension of the famous meeting spot for Hotel guests, provides a chance for visitors to fully immerse themselves in the Riva experience in one of the world’s most exclusive venues. Thanks to the Film Festival and the prestigious temporary Lounge, the relationship between Riva and Venice has grown closer than ever, shining with a light reserved for superstars. Luigi Adamo, has been recently appointed Sales Director of the Sanlorenzo Yacht Division, a dedicated branch for fiberglass motoryachts ranging between 24 and 38 meter in length. The Yacht Division based in Ameglia and Viareggio shipyards handles the design, the construction and the sales of three Sanlorenzo models range: SL (planning hull with flying bridge models), SD (semi-displacement hulls) and the new crossoverSX line, which first SX88 model is going to debut in a few days at the Cannes Yachting Festival 2017 (September 12th – 17th). “I am very proud and honored to join Sanlorenzo – said Luigi Adamo -, one of the leading shipyard in the yachting business for its innovation, financial stability, tradition and product design. I am glad I am looking forward to contributing to the success and growth of Sanlorenzo”. Luigi Adamo graduated from university as Naval Architect and Mechanical Engineer. With over twenty years experience in the yachting industry, he was made Service Manager and afterwards Product and Project Manager of Azimut-Benetti Group, till he become Sales Manager of MegaYacht Benetti. His last role position was General Manager of the Hong Kong based Benetti Asia. Sanlorenzo’s 2016 turnover reached 314 Million euro, +42% more than the 220 Million Euro in 2015; 25.4 Million Euro EBIDTA, 21% more than 2015, achieved thanks to a steady production growth of 28 yachts and 5 superyachts sold in 2016. Sanlorenzo is currently operational at three different production sites within 50km from each other: the Yacht Division (Ameglia and Viareggio shipyards) and the new site of the Superyacht Division in La Spezia dedicated to the construction of superyachts in metal from 40 up to over 80 meters in length. Sunseeker International is delighted to announce its new long-term partnership with Blue Marine Foundation, a charity dedicated to protecting the oceans for future generations to enjoy. Blue is a UK-based charity established in 2010 by the team behind the film ‘The End of the Line’, which brought the world’s attention to the crisis of overfishing. The partnership with Sunseeker will increase awareness of ocean conservation by encouraging people to think about their impact on the oceans and how they can help save our most valuable resource. Sunseeker will also be working with Blue to support the Blue Marine Yacht Club. Launched in 2012 by His Serene Highness Prince Albert II of Monaco, the Blue Marine Yacht Club was formed to unite the global yachting community in a clear mission to protect our ocean. BMYC members play an active role in ensuring that our seas remain a natural resource for the future. All revenues raised from membership go directly to support Blue’s work around the world. Sunseeker fully endorses the BMYC and will actively promote membership with its clients to shape the way the ocean is protected for years to come. Vital projects undertaken by Blue include the creation of a marine protected area around Ascension Island; restoring natural shellfish populations to the Solent; introducing sustainable fishing in the Aeolian Islands; and aiding in the clean-up of ocean plastic waste in the Mediterranean. These are just some of the projects taking place around the world today, with many others in need of urgent funding. Yachting Pages Media Group’s highly anticipated superyacht App in association with Sunseeker has now launched. The App has been designed for superyacht captains, owners and crew and will provide users with access to an extensive worldwide database of suppliers both on and offline. As a world leader in providing products and services to the superyacht industry, YPMG has carried out extensive research to create an app that meets the needs of senior crew and owners sourcing suppliers and services. Out of the captains and senior crew surveyed at Fort Lauderdale International Boat Show 2016, 86% said they would download and use a Yachting Pages Mobile App. The Yachting Pages Mobile App is available for download on both Apple and Android devices. Yachting Pages Media Group launched in 2003 and, since then, has established itself as a trusted, comprehensive resource for superyacht crew; helping businesses to market their services to a global audience. George and Beryl Robinson's Viking 55 Polarizer with Captain Jeff Thiel released seven white marlin to win the Ocean City Marlin & Tuna Club's Overnight Billfish Tournament. Polarizer angler Tommy DeRose released three white marlin, Jace Alzheimer released two and John Cashman and George Robinson each released one. The boat hit the leaderboard as Top Overall Boat and Top Release Boat. 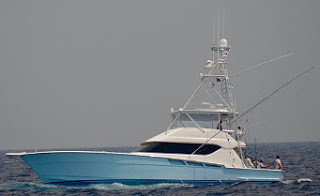 The Viking 62 with Brian Komer at the helm released two white marlin and a blue for Second Place Overall and Third Release Boat. Viking 62 angler Dan Pettit released a white marlin and weighed the Top Tuna of the tournament, a 67.5-pounder. Sean Healey released a blue marlin while Justin Healey released a whitey. Second Place Dolphin went to Tom Montague with a 14-pound fish. Tom fished the Viking 46 Captain Chazz. Battling it out in an area known for its custom sportfishing boats, Don and Frances Mills' Viking 72 Sea I Sea rose to the top. Releasing one blue and three sailfish,Sea I Sea claimed the highest title, Top Boat, in the prestigious Carolina Boat Builders Tournament. Congrats Captain Rob Mahoney! Thanks to the generosity of anglers, donors and sponsors, $70,000 was awarded to Dare County college and graduate students in 2017. It was a wild week at the White Marlin Open. The weather was so snotty that less than half of the 353-boat fleet took on day one, and only 12 boats ventured out on day two. This forced most boats to fish the final three days. With so many boats fishing the second half of the tournament, the final day at the scales saw $3 million dollars change hands in just the first 40 minutes. White marlin were playing hide and seek, so many boats switched gears trying to fill the empty spots on the meat board. On Wednesday, the 3rd fishing day but the first for the Viking 62 Intents, angler Joseph Sadler took the first bite of the tournament and thumped a 68.5-pound tuna on the deck. Sizing it up, Captain Rhett Bailey thought it looked like dinner. Buddies Danny Scotti and Roger Ruby convinced Intents owner Alan Sadler to head to the scales with it. Lucky they did. That fish earned the team a record tuna payout of $12,642 a pound! "Of all the ways I dreamed of winning big money at the White Marlin Open, the tuna category never occurred to me," said Rhett. "Catching tuna is not really our thing, and we almost didn't take it to the scales. We're so happy this fish held on for three days! Thanks to all of my team members: Alan Sadler, Joe Sadler, Van Wichers, Kyle Francis and Garrett Penley." Rounding out the tuna category, Kris Rainear fishing the Viking 50 Warden Passfinished 3rd with a 67-pound fish while Jared Brown on the Viking 55 Slabjack was 4th with a 65.5-pound fish. The Viking 60 Caitlin put angler Jim Murray on a 64-pound tuna good for 5th place and Jim Stavola on the Viking 55 Milling Aroundclaimed the 6th spot with a 64-pounder. Gail Jones fishing on her Viking 62 Reel Toy released a white and blue marlin for 3rd Place Lady Angler. Greg Beane on the Viking 68 Oasis was the 19th Top Angler with a white and blue as well. The Viking 62 Business boated a white marlin on day one which hit the leaderboard in the top spot. Angler Michael Logan weighed the 76-pounder which held on the board until Friday. Despite Mother Nature's mood, the fleet released 390 white marlin and boated 19 for a 95% release rate. Thirty-four blues were released and none weighed. 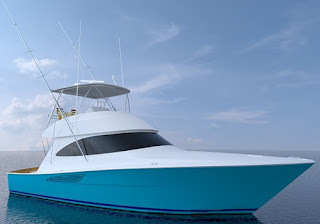 Congratulations to Will Cocke and his team on the Viking 61 Suzy Q. Captain Eric Carr led the crew to a 1st Place overall finish in the recent Texas Legends Billfish Tournament with 3 whites, 2 blues and a sailfish. A grand slam! Second place was awarded to Ron and Mary Ann Rabb fishing their Viking 52 Lady Mary Ann. Bandit, a Viking 82, and the Viking 55 Deez Nautz took 4th and 5th respectively. The top swordfish went to Robert Brown's Viking 61 Mono Chongo with a 146.1-pound fish. Floyd Appling's Viking 74 Bimini Babe weighed a 45.5-pound tuna for 3rd Place Yellow Fin. Going five for six on white marlin, the Viking 70 Krazy Salt's took 1st Place at the recent Stone Harbor Marlin Invitational. Congratulations to captain Keith Greenburg and mate Luke Hickey. The Viking 62, with captain Brian Komer at the helm, took 2nd Place with three white marlin releases. Top Junior Angler was 15-year-old Logan Rutt on the Viking 62. The team on the 62 is pictured above. Forty-four boats were in the mix at the recent Montauk Canyon Challenge. Event veteran Rebel, Mike Tucci's Viking 52, was the Grand Champion when the dust settled. Rebel also caught the 1st Place Heaviest Tuna with a 220-pound big eye. Greg Marzuk's Viking 43 Blue Water weighed the top yellowfin at 62.2-pounds.Relentless, the Viking 52 owned by Tim Schmidt, thumped some tuna on the deck to win the Top Three Yellowfin Weight category with 167.5 pounds, while Pete Rhein's Sneaky Pete was right on his transom with 161 pounds for 2nd Place.Sneaky Pete also won the wahoo category with a 15.4-pound fish. Scott Savage and his Viking 50 Reel Savage landed on the top of the leaderboard in marlin releases, and Harriet Ball, fishing the Viking 56 On The Ball, was the Top Lady Angler. Fishing a Viking 92, team Fa La Me made tournament history last week, capturing the Bermuda Triple Crown for a record-setting third time. "When we were building this boat I heard people mumbling that we couldn't be competitive in a 92-foot Enclosed Bridge sportfish boat, but we're breaking, no, we're smashing, records on this boat!" says Frank Rodriguez, who owns the Viking with his wife Mary Ellen. Team Fa La Me, crewed by Captain Rob Moore and mates Taylor Beckford, West Rivers and Tyler Beckford, took this year's Triple Crown in dramatic fashion, nearly lapping the fleet with a record nine blue and 10 white marlin releases during the nine days of tournament fishing. Azimut S line since introduced in 2003 has been an important game changer for the industry which reshaped the sport yacht sector from its introductory model the 68S onward. The new S7 continues to see the Italian builder pushing its successful S line to new limits of design, and the next stage of what was started with the forward thinking third generation S-series, the 55 as presented in 2012. 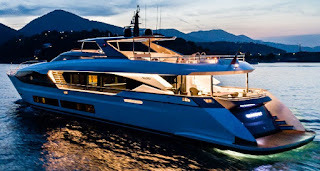 Launched in another huge party plus a tour around the Mediterranean the S7 made an important scene entrance in early August in Formentera Ibiza where it appeared to the public for the first time. At seventy feet the S7 is a direct heir to the 68S and impresses for being a modern advanced hard top sports yacht. The layout below offers four double cabins, while living plus galley is all located on the main deck. The S7 also offers flexibility with choice to the client coming on order for a Coupe or Sportfly version. Hull one shown above is a Sportfly version, which personally at this size I think will be a difficult temptation to resist. On the technical side the S7 continues Azimut full dedication to a triple Volvo IPS pod set up, as introduced with the 55S and followed with the 77S. In this case the S7 is powered by a triple Volvo 800hp engines which give a top speed of 35 knots and a cruise of 31. It will be interesting to see if the S7 is able to follow what the 55S does with the triple set up, as for example the economical use of two engines only. Austin Parker present the project for a new AP44 Sedan. Designed by the famous Fulvio de Simoni, the Italian designer continues the formula he used on previous AP models for a modern cruiser with inspirations mostly concerning the super structure to the traditional lobster boat. The AP44 Sedan will be the second new Austin Parker for the fall 2017 boat show season with the Italian boat builder completing finishing touches to the 48 Sundeck. The AP44 Sedan will feature a two cabins two heads lower deck. But its most important feature will be its main deck layout, this with an astern galley, C-shaped dinette, and sun-pad to aft. The saloon galley area is separated by a patio door, this allowing for easy all year usage. It will be interesting to see if the AP44 as it happened with the successful 42 will offer variants to the range from Open no patio door to Sports without hard top versions. Being a semi custom builder it all depends what the clients and market asks to Austin Parker. Power wise the Austin Parker AP44 Sedan will be powered by twin Cummins 480hp with traditional line shaft propulsion. Charles A. Carter, 102, died peacefully on Saturday August 26, 2017, at Aurora Medical Center with family by his side. He was born on June 11, 1915, son of the late Charles and Fern Carter in Indiana. Charles graduated from Mentone Indiana High School. He also graduated from Chicago Aero Nautical University. Charles then moved to Buffalo, New York and worked at Bell Aircraft during the war years. He worked as a supervisor at Allison Airplane Corp. His love for boat racing brought him to Green Bay, WI, where he owned and operated Green Bay Marine Mart. Charles and his partner, George Ver Hagen opened Carver Boat in Milwaukee. They later moved to Pulaski in 1999. The company is still in operation as Marquis and Carver Boats. In 1959, he married Betty Lou Esslinger. After selling Carver Boat Corporation, he went back to his first love, airplanes. They opened up Pulaski Airport and remained there for five years. 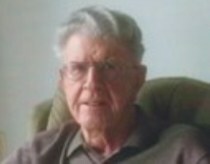 He and his wife, Betty, moved to Florida, where they lived for the next 40 years. They soon started an Aircraft Corp. in Sebring, FL. They owned and operated it until they moved back to Oshkosh in 2005. He was a member of Christ Lutheran Church of Oshkosh. Charles is survived by his wife, Betty Lou (Esslinger); sons: Charles (Patricia) JR. of Escondido, CA and Gary (Karen) of Krakow, WI; granddaughters: Frankie (Allen Babe) Carter of Caledonia, WI, "Chuckie" Carter of Escondido, CA and Marnie (Jack Stubbs) Carter of Escondido, CA; grandson, Brad (Joann) Carter of Burnsville, MN; sister in law, June Backus of Oshkosh, WI; and numerous great and great-great-grandchildren; and special nephew, Mark Backus. He was preceded in death by his parents, granddaughter, Toni Gayle Apelando; the mother of his two sons, Ethel Fisher; brothers and sisters-in-law: Alvin (Jane) Fauk, Henry Backus, William (Germaine) McGraw; father and mother-in-law, William and Elsa Esslinger. This new Princess V40 replaces the successful V39 sold to near two hundred units in a five year production run. Essentially based on the V39, the new V40 features changes coming for the most part outside; new large hull side window, and featuring a lightly couple inches more extended bathing platform. For the rest the new V40 is identical to the V39 it replaces; two cabin interior with a saloon and galley in between, and a main deck which works very well and available in two variants of a C-shaped dinette, and a dinette plus sun-pad. Interesting option two does not take any space from the dinette but puts tender space restrictions to height. Following the sale of 50m and K40, Cerri announces the new order from an Italian for a 27m “Fuoriserie” yacht. Bearing witness to Cerri increasing success in the fully-custom yachts segment, this new build is commissioned by a famous Italian fashion designer to develop the yacht of his dreams, a fully-customized project penciled by designer Tommaso Spadolini, who took care of both the exteriors and the interiors. The new project, expected to be delivered in summer 2018, consists in a 27m fast motoryacht with aluminium hull and superstructure capable of reaching a maximum speed of 40 knots thanks to 3 water-jet engines. Both the exterior profile and the interior layout will reflect the strong personality of the Owner, who asked for a super sport yacht enhancing maximum contact with the sea while also ensuring the utmost privacy. To provide some more details, the master cabin located behind the helm station will extend across the entire main deck. A central sky-light will let in plenty of natural light, while aft, the large cockpit fitted with concealing curtains will allow to fully enjoy the sea in privacy. The lower deck will feature two guest cabins and comfortable crew quarters, and the fly will include a private area with pilot seat. The tender will be located forward. Cerri Cantieri Navali is increasingly showing its strong drive for innovation, flexibility, and world-class shipbuilding quality through fully-custom projects that are tailor-made to clients taste and desires. The coming years will be interesting times at Fipa Maiora as the company and its famous line of motor and super yachts enters a new era with exterior styling design duties now taken care by Quartostile from Turin. Quartostile will face an interesting challenge taking duty from the long standing Roberto del Re who gave the Viareggio builder an important timeless identity from the eighties onward, and created with the 20 model launched in early nineties an irresistible contemporary design which lasted production and success for over twenty years. Maiora and Quartostile will revamp the whole line and currently the Viareggio builder has also commissioned projects for a currently in build 26, 30, 42 and 46 meter models. Interesting to note that Maiora new models over thirty meters will be available with the Royale triple deck version. Also following Maiora history I think its possible to see more flexibility to these as the FB full-body variant and also more sleek non raised house pilot house versions for the smaller units. As all Maioras the new 36 FB hull one is custom build to order and the Viareggio builder declares it to be one of the most spacious yachts in its size. Internal layout is for five guest cabins with the owners stateroom located on the full body forward part of the main deck. Crew accommodation is for five berths in three cabins. Maiora 36 FB is powered by twin MTU 2600hp which reaches a top speed of 30 knots and can cruise at 26 knots. Long range capability is for 1100 nautical miles at a twelve knots speed. Popular these days is the advent of a two-boat fishing program; one for the Atlantic/Caribbean, and one for the Pacific. Bayliss Hull No. 23, at 75, will be part of a two-boat program, and the owner’s second Bayliss hull. Exterior features include a natural teak cockpit bulkhead, toe rail, transom, and more. Built for travel to remote destinations, she will be equipped with seven custom stainless refrigerator/freezer boxes, all fabricated by Bayliss Boatworks. The interior layout is designed around a center island galley and a very symmetrical, balanced living space. Below will be a four double cabins layout. Systems will include a pair of Tier 3 Northern Lights 30kw generators, a Seakeeper 26, dual 1,000 pound-per-day ice-makers, an FCI watermaker, and much more. Hull 23 will deliver in late summer of 2019 and will be powered by twin 2600hp MTU engines. Founded in 2006, XL Marine has had a good success with its 43 and 51 models, with the South Rome Italian boat builder expanding on this by launching its 45. As information goes only one 45 has been build launched in 2014. So why we are presenting this now? Because pictures have been very hard to come by. The XL 45 is based on the 43 hull extended in length and with this coming out with a totally different internal layout and bigger engines. It is as XL Marine always stated an evolution of the species in this case of the 43 model. Indeed thanks to this extension XL Marine 45 offers a spacious lower deck with options for a three double cabins two bathrooms and a galley, two double cabins two bathrooms plus one crew cabin with private bath and a galley, and last a more traditional two double cabin two bathrooms plus C-shaped dinette and galley. 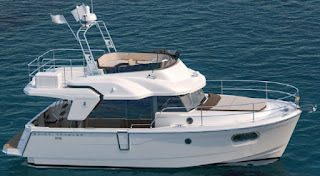 The XL Marine 45 is also offered with a hard top option with the looks of this similar to what is offered on the 51. XL Marine 45 is powered by twin Cummins 550hp which give top speeds up to forty knots. Sunseeker present the project for a new 76 Yacht, a model which replaces the 75 and takes design cues from the successful 66 Manhattan as launched in early 2018. The 76 Yacht seems to have been incredibly received by dealers and clients with eighteen units pre-sold on plan. The 76 Yacht certainly hits the sweet spot in terms of size, space and a larger yacht feel whilst being extremely manageable for those looking to self-crew. Clever design maximizes social and entertaining spaces, whilst the innovative use of glass enhances natural light, making this a bright and airy boat in which to relax and unwind with family and friends. The optional retractable glass skylight over the lower helm, creates an almost open boat feel to the helm and the adjacent companion seating area to port which is the ideal spot for guests to enjoy the view whilst underway. Natural light also flows into the main deck through extended window lines and unique full-height glazing on the port side. The 76 Yacht exterior decks provide unprecedented levels of space and flexibility that can be can be adapted to suit any needs, whether relaxing, entertaining or both. Space is on the new 76 Yacht is about 25% more than the highly popular 75 predecessor it is going to replace. The cockpit for example can be adapted to provide additional lounge seating or a cocktail bar for afternoon drinks and the option of a ‘beach club’ complete with BBQ grill, fold-out seating and full height rain shower makes full use of the extensive bathing platform which is large enough to carry a four meter plus rib. The vast flybridge is another exceptional feature of the 76 Yacht, and the impressive layout can be further enhanced by the addition of an optional spa-tub and cocktail bar to further complement that larger yacht feel. 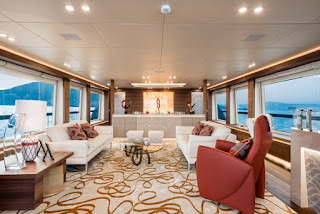 The light and space continues below deck, where there are four cabins and four bathrooms, including an impressive full beam master suite with ensuite and dressing area. The spacious crew cabin can accommodate up to three people in an open-plan layout or can be specified with an enclosed double berth cabin. The Sunseeker 76 Yacht is powered by engines up to twin 1550hp engines, which should deliver a cruise of 25 knots and a range at this speed of about four hundred nautical miles. New website for renowned Spanish company Astondoa, builder of cruisers and yachts from 35 up to 197 feet. Astondoa was founded in 1916 by brothers Jesus and Jose Astondoa Marinez. In 1944 second generation Jesus Astondoa Santamaria joins the business and soon after that takes over the shipyard. But the real growth path for Astondoa starts in the 1980s when the Spanish builder starts to build in fiberglass, and after that in the nineties introduces the GLX range. This step will eventually lead to bigger yachts being build and Astondoa going into super yacht sizes over 24 meters. Astondoa currently produces 22 models in five different ranges; Coupe, Flybridge, Century, Steel, and Topdeck. Astondoa current entry level model is the still in project 355 Coupe, and the flagship is the still in design stages waiting for an owner 197 Steel. Astondoa new website is available in Spanish, English, and French language and takes you around with the following buttons; Models, Company, Distributors, News, Select Range, and Contact. Astondoa new website also features links to its social media pages; Twitter, Facebook, Instagram, Linkedin, Youtube, and Pinterest this located at the bottom of the entry page. The sea awaited reverentially and eagerly as the new 92-footer by Ferretti Yachts entered the water with the calm might of a nautical giant. The launch of the first Ferretti 920 took place on 20 July at the brand’s private dock, which is just a few waves away from the shipyard in Cattolica. The Ferretti Yachts 920 is a flybridge yacht like no other. It stands out thanks to its monumental, dynamic forms, its innovative design features (such as the wide body concept of the owner’s suite on the main deck), its superb functional flexibility (including the option of switching from a four cabins to a five cabins version), and the vast spaces in its groundbreaking bow area, all of which can be used by guests. The interiors are just as breathtaking, with numerous spacious relaxation areas and sophisticated layouts steeped in original, unprecedented elegance. As always, the new yacht was produced in partnership by Zuccon International Project, the Ferretti Group’s Engineering Department and the Product Strategy Committee. This new Ferretti super yacht will make its official debut at the Ferretti Group Private Preview in Monte Carlo in September, before its international public premiere at Cannes Yachting Festival in the same month. In the shipyard, work has already begun on the next units, which will be launched in the coming months: the second Ferretti Yachts 920 will be transported to the United States, where it will be unveiled in style at Yachts Miami Beach in February 2018, while the third vessel which features the famous Tai He Ban layout designed by Ferretti Yachts for Far East markets and owners will also make its first appearance next year in Asia. Wider is delighted to announce the project for a new 130 model. The 130 project in theory is a replacement of the 125 of which supposedly was sold in 2016 and is currently under construction. The aggressive styling of this full-displacement all aluminium super yacht is designed by the in-house Wider team offering exceptional range and generous living space without compromising the clean modern lines that the Italian builder is known for. The sporty exterior styling of the Wider 130 allows for huge deck space totaling more than two hundred squared meters, split into three distinct luxury areas: the fore deck for sun worshipers, bridge deck aft for alfresco dining, and the generous beach club. Wider 130 will offer six double guest cabins sleeping twelve guests. Performance is a max speed up to fourteen knots while range can go up to 4200 nautical miles at 8 knots. It's been a two year journey for this project to come into reality, and finally the Riviera 68 Sports Motor Yacht has arrived in all its glory. It is an interesting and different offer from Riviera and yet the 68 Sports Motor Yacht embodies what the famous down under builder has been doing since about a decade when it launched the 3600 Sport Yacht, hybridizing various yacht styles into a practical design. This new 68 Sports Motor Yacht takes hybridizing yacht styles to a new level, and yet it all seem to work so good both on the aesthetic point of view and the practical. Volvo Penta presents the new D13-1000 which sees the Swedish engine maker move into the 1000hp marine leisure engine market for the first time, and provides higher performance, greater durability and more comfort than ever before. The inboard engine and its equivalent from Volvo Penta’s Inboard Performance System (IPS) range, the D13-IPS1350 have been designed for the benefit of customers operating yachts of up to 120ft. As a mark of its commitment to the marine leisure industry, Volvo Penta has carried out a major redesign of the 13-liter engine model and drive train in order to offer an outstanding new product. High-end yacht customers will be able to reap the benefits, as features such as new pistons, highly efficient injectors and improved cooling systems, combine to produce 11 per cent more power than on previous engines. The optimized power-to-weight ratio and excellent low-end torque of the D13-1000 provide incredible power on demand. With this new engine, Volvo Penta is giving premium boat owners the possibility to go further and faster than ever before. 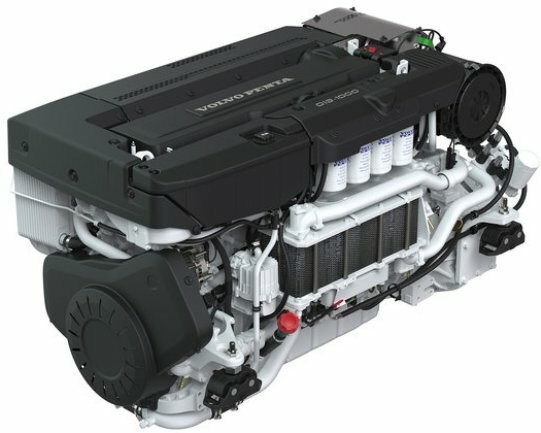 Volvo Penta’s D13-IPS1350 is an integrated package that matches the new D13 engine with an upgraded IPS pod drive. It is named D13-IPS1350 as the 1000hp engine provides the equivalent power of a 1350hp engine when matched to the IPS drive. As a complete package, the new IPS has all the traditional benefits of the system in providing a seamless link from helm to propellers, with superior grip in the water. When compared to a traditional inboard shaft engine installation, Volvo Penta IPS provides a longer cruising range, higher top speed, reduced fuel consumption and emissions, reduced vibration, and lower onboard noise levels. The configuration also allows for more space on board. Upgrades to the IPS pod drive have been made to match the new engine. The D13-IPS1350 package is available in twin, triple or quadruple installation; the latter of these provides power to the equivalent of 5400hp. Improved features on the new IPS drive can also be fitted on existing IPS units. The D13-IPS1350 has been field tested in a 68ft yacht and its data compared to a 1360hp traditional inboard engine from a Volvo Penta competitor. Volvo Penta’s unit was lighter with better displacement, used 36 per cent less fuel, had faster acceleration and a higher top speed, and lower noise and vibration. I.C.Yacht is proud to show the design of the 18 Brave model, first born of of a versatile and multi-functional sport yacht. I.C. Yacht has build a name by delivering custom build tenders to super yachts, and now with the 18 Brave the Italian builder aims to enter into the multi purpose sport yacht segment. I.C. Yacht 18 Brave will be build of infusion resin, to a full sandwich construction, with carbon fibers, and Kevlar reinforcements. She is to be powered by twin Volvo 625hp or 725hp engines with IPS pod propulsion. Hull one of 18 Brave is currently under construction and will be a full custom to order build. Heesen is proud to announce that on 1 July 2017, the world’s first Fast Displacement motor yacht equipped with hybrid propulsion was delivered to her Owner in international waters. Name M/Y Home and formerly Project Nova, YN 17850 is a fifty meter all aluminium super yacht below 500 GT with shallow draft and it underwent intensive sea trials in the North Sea for five days in calm sea conditions, with waves of up to 0.5m and light breeze. The results are impressive: not only has YN 17850 easily exceeded her contractual maximum speed of 16 knots in the traditional diesel engine mode, but also expectations in her hybrid ‘silent cruising mode’. Thanks to two 127kW water-cooled DC electric shaft motors, she exceeded the predicted speed of 9 knots with noise and vibration levels well below the specification levels. Heesen YN 17850 is not only ultra-quiet, but she is also extremely fuel efficient. At 12 knots, she has a fuel consumption of 98 liters per hour excluding generators and at ten knots in hybrid mode this further reduces to a staggering 45 liters per hour, which for a 50m yacht, displacing 295 tons and with a Gross Tonnage of 499, is an outstanding achievement. Heesen is renowned for its meticulous attention to weight reduction and YN 17850 is an effortless embodiment of this; being lighter than predicted, she is the perfect demonstration of Heesen’s signature capabilities. Heesen 50m YN 17850 will debut at the Monaco Yacht Show at the end of September. Viking present the project for a new 44 Convertible which will use the same proprietary running surface as the 44 Open, giving her the high performance of an express sport fish, and the stylish deck house, expansive salon and luxurious accommodations of a convertible. The Viking 44 Convertible is a comfortable, capable tournament contender with the largest flying bridge in her class, equally capable of running fast to the canyons on Northeastern weather days or blasting over to the Bahamas in the heat. Captains will appreciate the all around visibility of the 44 Convertible center console walk-around flybridge helm. Surrounded by comfortable seating, the helmsman can enjoy conversations with guests while operating the boat from an autonomous command center. 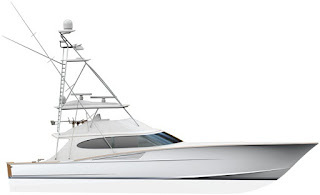 The Viking 44 Convertible will have eleven square meter of battleground in a cockpit that's armed with an arsenal of standard equipment such as flush rod holders, fresh and salt water wash down systems, a transom live well and a transom door with lift gate, tackle stowage, step-box cooler and an in-deck fish and a stowage well. Cranchi 60 HT is the fully enclosed version of the 60 ST, and as the more open sister-vessel is developed on the 56 platform launched in 2010. The 60 HT main difference is the patio door dividing and closing the main deck. This makes Winter boating more easy and makes the upper saloon a more cozy private area. For the remaining the 60 HT is the same as the ST version with three double cabin off which the owners suite is located to midships. Power comes from Volvo 625hp or larger 725hp engines, with IPS pod propulsion system. Following the success of the Swift Trawler 34, which dominated the small explorer cruiser long cruise segment for eight years, Beneteau announces the project for its successor, the Swift Trawler 35 set to launch this Summer and presented officially in September at the Southampton boat show. The Swift Trawler 35 is stylish and modern with valuable new spaces indoors and gives an incredible feeling of safety on board. Built on a semi-planing flared hull, developed with Beneteau and Italian designer Andreani, the Swift Trawler 35 has a Cummins 425 hp engine. The flybridge of the Swift Trawler 35 emphasizes the explorer cruisers harmonious profile yet marks her distinctive long cruise temperament. Broad walkways, lots of hand rails and high push pits exceeding regulation standards reveal the importance attached to safety on board. With regard to visibility, the Swift Trawler 35’s wheelhouse has a full around view and is bathed with natural light. For optimum comfort whatever the weather, the Swift Trawler 35 has opted for a modular exterior. Continuing to the far end of the starboard gangway, the awning closing off the cockpit unfolds quickly and easily from the flybridge structure. The exterior blind of the side door overlooking the gangway shuts off this space, providing privacy. The emphasis on protection is repeated on the flybridge with the semi-hard Bimini or soft top with built-in LEDs. The soft top’s stainless steel arch features the elegant Beneteau signature mark and can be used to support antennas and flags. 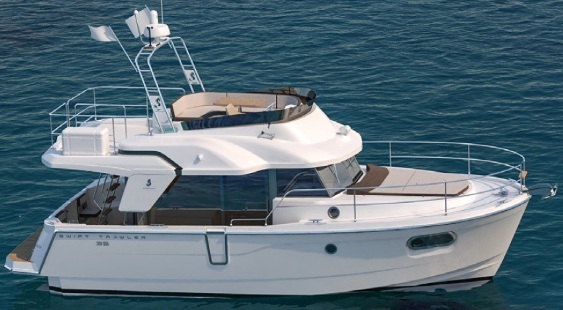 The Swift Trawler 35 is designed to offer more space on board, so the flybridge easily seats six people. With an optional fridge, a driving station with repeated navigation instruments, a rotating driver’s seat and a double sun-lounger at the stern, this fully flush living area offers a comfortable experience on the roof of the boat. The Swift Trawler 35’s interior is as elegant as it is practical, with matching teak and easy to maintain upholstery. The owner cabin is reached through a gullwing door making it easy to move around. The second twin cabin with bunk beds has a spacious and fully fitted shower room with independent shower. The sofa bed in the saloon provides an extra berth at night and it can be shut off from the wheelhouse by a curtain. The launch of the new Ocean King 130 has occurred last 24th April in Chioggia, Venice. Ocean King 130 has been coordinated for the architectural project part and fitting by inNave, internally and externally designed by the well-known designer Andrea Vallicelli and built by Cantieri Navali Chioggia shipyards. Ocean King 130 is over forty meters long, ten meters wide and has a 170.000 liter fuel capacity. Besides the broad internal spaces, Ocean King 130 has a very large external upper deck able to host two tenders and two lasers plus an ample sun deck and a dining area. As the other explorer yachts from the Ocean King series, 130 has been designed and built to be able to sail worldwide, dealing with any weather conditions. Conceived and built as a real ship, taking inspiration by tug boats, Ocean King 130 offers an accommodation of twelve guests in six cabins plus seven crew members. Second to launch the Ocean King 130 follows the line of the other Chioggia explorer yachts, and is provided with professional technical equipment and not pleasure craft ones; therefore, it can boast a superior technical level of types of machinery, materials, and instruments, which guarantee a professional security and functionality. Within less than a year from the previous launch of Ocean King 100, this new 130 takes advantage of the shipyards investments for the upgrade of the new warehouse in Chioggia. Alen range continues to expand with the project for a 70 flagship model. The Alen 70 is moving the concept forward with a three cabins six berths interior layout; VIP, Master and a Guest cabins, including a master head, a day-head with a full-size kitchen on the lower-deck, and an extra crew cabin available as optional. Outside the Alen 70 will accommodate sixteen people on-board. Alen 70 concept follows the Turkish builder traditional and modern style design of the exterior completing the minimalist architectural approach within the interior where each single detail is considered for comfort. The full beam master cabin of the Alen 70 provides spacious storage areas, a make-up table with a separate resting-area. Inner parts providing wide and open passages where the light colors are dominant. Comfortable sitting and sunbathing areas are the vigor on the main-deck provided with a T-style open type hard-top protecting guests on-board when outside with it’s unique design incorporating bulwarks. Now in the peak of the Summer and the 2017 boating season, this year is showing that the major players of the industry are seeing positive results and finally are giving more to the customers, with interesting creative events as we have not seen in recent times. This means that marketing departments budgets are increasing. One of the most creative players in this regard seems to be Azimut who is organizing an interesting Mediterranean tour for the launch of its new S7 model. We have to remember that in this regard the Azimut-Benetti Group never stopped doing its famous Yachting Gala event which has been ongoing non stop in the best and the not so good times since 2007. Also to say is that this is not the first time Azimut does something similar, and the launch of the Magellano range with the 74 model had went into a tour in the fall of 2010 around the central West part of the Mediterranean sea. Beneteau Group dealers have jumped on a total different strategy offering an interesting competitive priced internal charter program for its boat owners in France. While Ferretti Group seems to encourage its dealers; with the American, Greek, and Slovenian dealership all active in organizing events in the most sought places of the area and region they represent. Surprisingly the trio of British builders seem to be quiet in this regard with the exception of Fairline who did a rendezvous in late Spring which also coincided with the fiftieth birthday of the boat builder.